The Iraq and Afghan Veterans of America (IAVA) rates representatives and senators on thier support of veterans. The methodology is simple. IAVA Action has a straightforward approach to scoring lawmakers’ support for veterans. #e grade is not a comment on a legislator’s party, platform, history or character. Nor is it and endorsement or rejection of that particular lawmaker. It is based solely on their action or inaction in voting or sponsoring IAVA Action’s legislative priorities outlined in IAVA Action’s 2009 and 2010 Legislative Agendas. Each of these votes was an opportunity for Senators and Representatives to take a stand on behalf of Iraq and Afghanistan veterans. IAVA has been vocal on these issues through Congressional testimony, direct lobbying, and advocacy in national and local media. 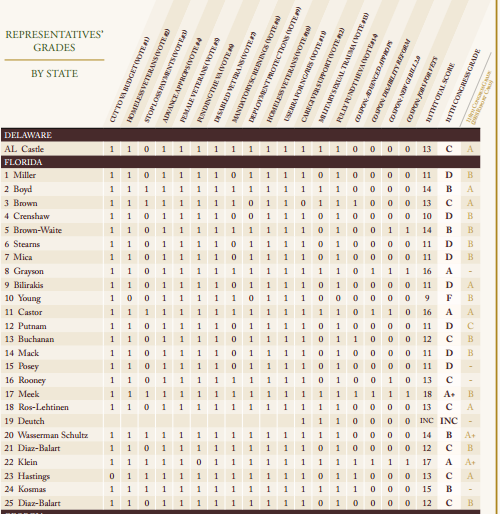 The significance of each vote is described in the “Vote Description” section of the report card. Here is the vote from FL Representatives for 2010. A vote with a 1 is pro-vet and a 0 is against the vet. Some representatives were given incomplete because of their short terms. CW Bill Young and Gus Bilirakis got an F and D respectively. Some of our central FL neighbors like Alan Grayson got an A. Kathy Castor got an A. DNC head, Debbie Wasserman Schultz got a B.
Connie Mack who is running against Sen. Bill Nelson for the US senate, got a D.
Florida is typical of most of the other states. Democrats support veteran bills and the GOP congressman more often vote against them. You will not find the IAVA discusiing this, but this become obvious as you peruse the report cards. Of intrest, after 2008, the IAVA stopped listing party affiliations. A right winger named Paul-Gregory Matuszak tried to explain this away by suggesting that an extreme socialist had debated the IAVA report card. Well, certainly if the a socialist was involved with the report, it must be tinged with pink. Mr. Matuszak has some valid points about separating VA and DOD issues. But then he suggests that the IAVA should delve into the riders and amendments of bills. Certainly, this would create an unrealistic workload for IAVA. The writer also says IAVA ignored some of the "better bills." He got subjective at this point. Who decides which are the better bills? Rightardia would agree that only bills that made it to the floor should be evaluated. If a bill is shelved that IAVA suported, it should be noted the bill was withdrawn. But the congresman should not be rated on dead bill votes. Paul-Gregory Matuszak also lamented that the 112th congres had not been rated in 2011, but that report was supposed to be published today. The IAVA only publishes its report card every two years. Rightardia considers the IAVA report card to very important because it can separate political reality from political rhetoric. Of interest, CW Bill Young just got his third F from IAVA since its first report in 2008. Rep. Young is a senior Republican in congressional armed forces issues. Veterans need to elect people who support veteran programs. They also need to vote people out of office who don't support veterans.